Our next event takes place in the month of September. It is a ride from Cheyenne, OK to Elk City, OK. The ride starts at 8:00 in the morning and ends in Elk City about 4:00. 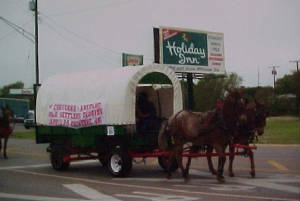 The wagon train then rides in the parade the following day. Food and travel expenses on your own. Bring sacked lunch for wagon ride. Wal Mart for the next day. No hook ups at the park. Please note, the wagon train turns East before getting on Hyw 6 and parallels it about 1/2 mile North, coming out on Country Club road and then Right toward the park, by the High School.